It’s that time of year when families with schoolchildren everywhere scramble to keep them clothed and supplied so they can focus on learning. Across the ocean, though, students – particularly girls – face hurdles that are relatively unknown in the U.S. And Florida Conference churches are reaching out to help. Cheri Roland of Hyde Park UMC, above, prepares to distribute clothes made by sewing ministry volunteers to children in South Africa. 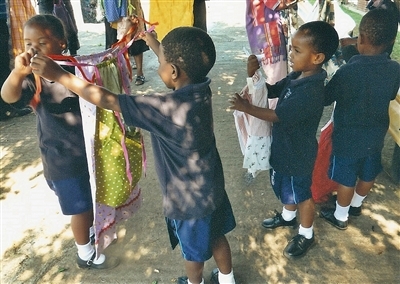 Below, children in South Africa check out a new look. Photos from Hyde Park UMC. For example, volunteer sewing groups at Stewart Memorial UMC, Daytona Beach, and Hyde Park UMC, Tampa, stitch together and deliver clothing and personal hygiene items for girls in Africa. At Stewart, the focus is on sewing “comfort kits,” including washable pads, for girls in Kenya. 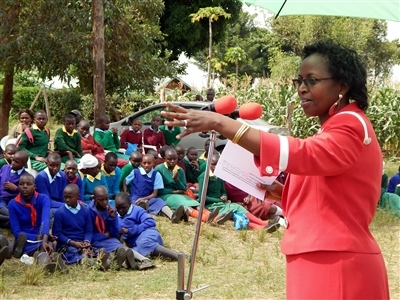 The effort helps reduce student absences attributed to menstruation. At Hyde Park, a sewing group began about four years ago, making dresses for girls in Africa after one of the group’s leaders saw a television news story about the needs there. Volunteers from both churches say the ministry offers rewards both to those who fashion the gifts and those who receive the fashions. The group from Stewart has joined forces with a local women’s group called The Links Inc., a national service organization for professional women of color. Another Stewart member, Celestine Hinson, is active there. An Alachua County Girl Scout troop where Childs has a cousin involved has been sewing washable sanitary pads for distribution in rural Africa as well. Childs and Hinson were part of a church group that visited Kenya in May. 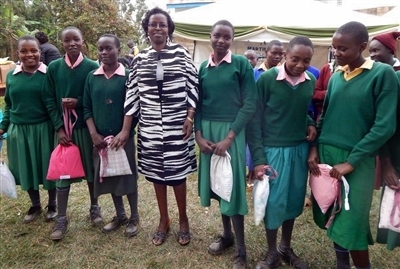 They took 100 drawstring bags with school supplies from the church and distributed them at the Runywene Primary School in Tharaka Nithi County, where they learned about the ongoing problems for girls. The group came back home and got to work. “This is a project that has blossomed for us,” Hinson said. Today, there are about 30 to 40 volunteers working on the effort, called “Kenya Girls Mission Project,” and the church gets calls and emails from others who would like to volunteer. There have been some instructional workshops held and more scheduled. Donations are welcome, as one of the materials used on the shield -- a waterproof fabric -- is very expensive. “It can cost about $15 a yard, so we buy it on sale when we can,” Childs said. In Kenya, the group made contact with one of that country’s governors, Samuel Mbae, and his wife, Lucy Ngeri Mbae. Her personal initiative has been to eliminate obstacles that keep girls from excelling. The governor has since visited the Daytona Beach area to see his sister, who is the wife of Stewart’s pastor, Rev. Dr. Silas M’Mworia. Lucy Ngeri Mbae of Kenya, above, talks to students during a mission visit from church volunteers. Below, she stands with girls who received "comfort kits" from Stewart Memorial UMC's sewing ministry. Photos from Jessie Childs. The mission project recently produced 100 kits for delivery to the girls. Individuals with ties to Kenya deliver the kits, while the church pays the baggage fees. Shipping costs are high, Childs said, and the arrangement provides security that the kits will reach the girls as intended. Another 100 kits are scheduled for delivery in December. The benefits to the church, where volunteers meet for training and sewing, are great, said Hinson. Childs also spoke of a community-wide service fair slated for late September at Stewart and the surrounding neighborhood. Volunteers in Hyde Park’s “Little Dresses for Mission” effort also have sewn personal care kits but currently focus on dresses for girls in Africa and other developing countries, said Darryl Painter, one of the ministry’s leaders. Sometimes they also make shorts for boys. About a dozen women meet at the church twice a month to sew or collect materials to take home. The church strives to avoid costly postage and actively seeks out mission groups -- from a nearby Baptist church, for example – to take the dresses with them. “We get the dresses there however we can,” Painter said. So far, the group has sent 2,000 dresses abroad and has plans to continue, with one problem, she said. 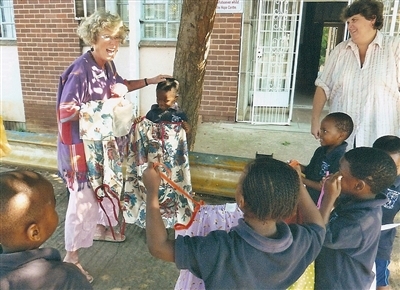 Cheri and Doug Roland, Hyde Park members who have served as Volunteers in Mission in South Africa, distributed many of the dresses in the past. In thanking the church seamstresses, Cheri wrote: “The little girls in the photos were THRILLED with the dresses in their bright colors and unusual designs. They have never had a new dress, have never had a dress of their very own, nor ever worn any piece of clothing that was not a hand-me-down.